With the week's diocesan newspapers beginning to drop, some added numbers are coming in from the weekend's Rites of Election... and while Hotlanta's throng of 2,000-plus catechumens and candidates was impressive given its Catholic population of roughly a million, an even higher ratio was drawn from the archdiocese of Denver (Catholic pop. 385,000), which welcomed over 1,100 newcomers in advance of their Easter Night reception. 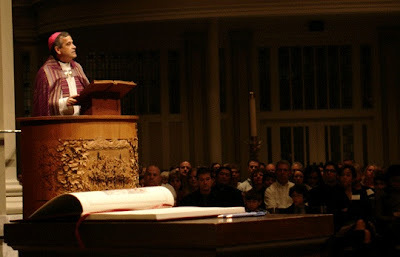 All told, the Stateside church initiated "as many as" 150,000 adults at last year's Easter Vigil. Whatever the figures by diocese, the Mothership's recent reminder is worth repeating: namely, that the work of welcoming and making the newest among us feel at home is never just for these pages or the papers, but the lot of us all... so, well, let's to it.